Carnival Corporation has donated $10,000 to the Oprah Winfrey Leadership Academy Foundation (OWLAF) in support of university scholarships for graduates?of the Oprah Winfrey Leadership Academy for Girls – South Africa (OWLAG), an independent boarding school founded by Winfrey to provide world-class education to disadvantaged girls in South Africa. 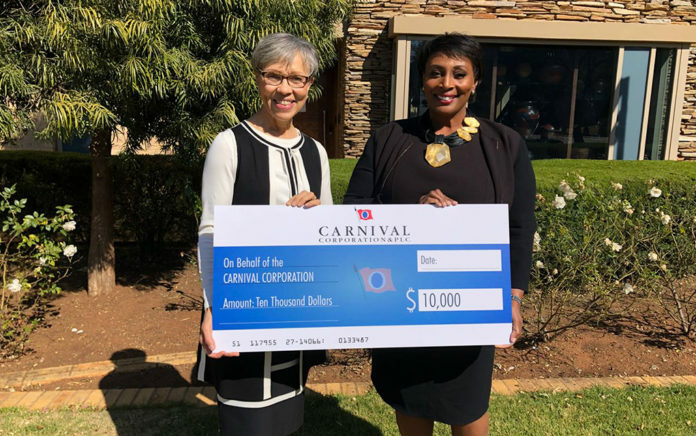 Carnival Corporation’s chief procurement officer, Julia Brown, presented the foundation with the gift during a visit today to the school in Johannesburg, South Africa, as part of her participation in the Centenary Delegation ? ?a delegation of American executives visiting Africa the week of the famed leader’s 100th birthday celebration to discuss relevant trends and topics and build business relationships. The delegation visited the school as part of South Africa’s national day of service in celebration of Nelson Mandela International Day, observed each year on Mandela’s birthday. The opportunity to support the school builds on the current partnership with O, The Oprah Magazine and leading global cruise brand Holland America Line, a division of Carnival Corporation. The partnership, which started in February 2017 and was recently extended through the end of 2019, includes: cruises featuring members of the magazine’s editorial team and special guest speakers; a variety of onboard activities developed with the magazine’s editors; new programming to be rolled out on many of the ships in the fleet in late 2018; and Oprah serving as the Godmother of the Nieuw Statendam, a maritime tradition for new ships through which she will dedicate the ship in a private ceremony in early 2019. As the world’s largest global cruise company, Carnival Corporation has a significant cruise presence in Africa across six of the company’s world-leading cruise lines, including AIDA Cruises, Costa Cruises, Cunard, Holland America Line, Princess Cruises and Seabourn. Carnival Corporation sails thousands of guests to more than 20 destinations in Africa, including stops in Morocco, South Africa, Tanzania, Namibia, Kenya, Madagascar and Mozambique. The Nelson Mandela Annual Lecture 2018, featuring former U.S. President Barack Obama.